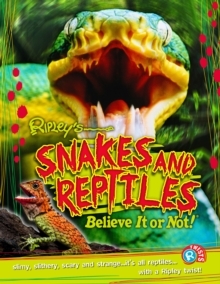 Brand new for 2015, Ripley's Twists: Snakes and Reptiles is the latest title in this award-winning children's reference series. Bursting with amazing photography, compelling illustrations, and all-new content, this easy-to-read book presents scientific facts with the unbelievable Ripley stories young readers can't get enough of. Available individually or as part of a series, Ripley's Twists books have proven popularity in classrooms, libraries, and homes all over the globe.